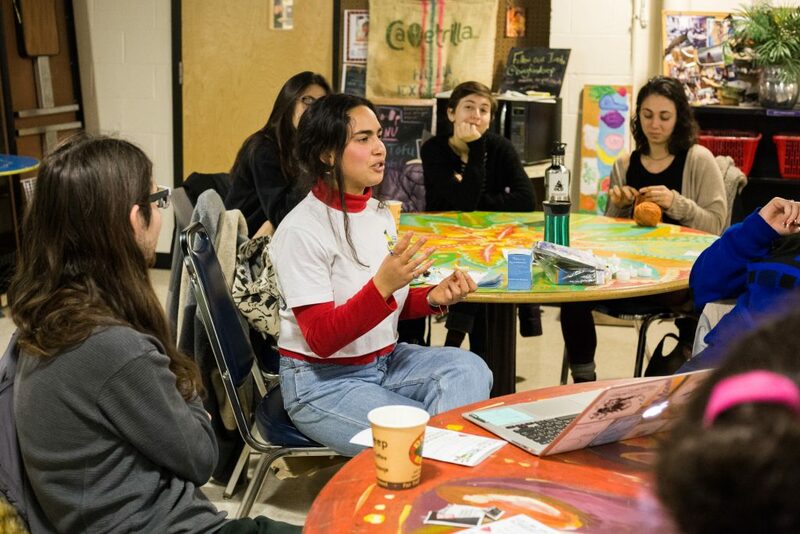 Rebecca Kiss/Photography Editor Last Thursday, the Food Co-op hosted a sustainable menstruation roundtable, focusing on the ecological impacts of the toxins and waste produced by pads and tampons. Menstruation impacts nearly half of the world’s population, and the current most common method of handling the flow of blood is the use of disposable pads or tampons. Recognizing the waste created by the worldwide use of disposable period products, the Binghamton University Food Co-op, a student organization focused on raising awareness about sustainable food practices, partnered with the Women’s Student Union (WSU) to hold a workshop about sustainable menstruation. The event was held at 8 p.m. last Thursday night in the Food Co-op, with the purpose of creating awareness of sustainable period management options that students may not have previously heard of. Students discussed everything from the way we talk about periods to the environmental toll of pads and tampons. Students even shared their own first period stories, experiences adjusting to and using alternative period products and methods of dealing with and managing menstrual pains in a socially, environmentally and physically conscious way. Elkouby’s inspiration for the event stemmed from personal experience abroad. According to Elkouby, a plastic, disposable sanitary pad takes centuries to decompose. Period waste ends up in landfills, leaching harsh, toxic chemicals into the soil or in the Great Pacific Garbage Patch. In addition to this, the environmental consequences of using disposable pads and tampons include the pollution and waste involved in the production of these female hygiene products. Students at the workshop discussed environmentally friendlier versions of feminine hygiene products, including organic disposable pads and tampons that involve fewer fossil fuels in their production, reusable pads, reusable period underwear and reusable silicone menstrual cups. Simon Abramov, a junior majoring in sociology, said that although the use of sustainable period products is only applicable to the portion of the population that experiences menstruation, the environmental consequences impact everyone. The conversation in the room was fast-paced, lively and energetic, with many people participating, sharing insight on their own experiences and interesting facts. Alena Rodriguez, a junior majoring in linguistics, said the discussion was balanced and thorough.